I meant to hit the road early last Friday, August 9th. It happened to be my 51st birthday, and I was heading a few hours north to a weekend seminar on aiki, or internal power, in martial arts. It was to be held at Orange County Aiki Kai (http://www.ocaikido.com/), a few miles east of Disneyland. I didn’t have a lot of details – not even a confirmation of my registration – but I thought I was supposed to be at the dojo at 6:30 on Friday evening. I had been looking forward to this seminar both on its own merits, and as a little weekend escape. I was hoping to get to the hotel by 3:00 to have time to check in, chill out, and enjoy a quick swim in the pool before the seminar began. Alas, getting ready for trips always takes me longer than I think it will. By mid-day I realized I was going to roll in at the last minute, so I put my swimsuit and cover-up back in the closet and stuck with the essentials – 3 days worth of gi and light sweats, because I didn’t know which we would be training in. All morning I was hustling to do laundry, clean up loose ends around the house, and pack. It was already after noon when I chucked my bags in the car and headed out. My hotel didn’t offer breakfast, but had a microwave and a refrigerator, so I picked up some fruit and snacks at a shiny new Mediterranean foods market near home while my car got a long-overdue oil change down the street. Then after a quick stop for fuel and a trip through the local car wash – my car was dangerously dirty – I was finally ready to go. I carefully entered “610 East Katella Ave” into the Google Maps app on my phone, put on some tunes, and hit the road. Luckily there wasn’t much traffic, but because of the late start I was just on track to make it to the dojo with barely enough time to change and warm up. I’d have to check into the hotel afterward. I followed Google’s directions, although it seemed to be taking me further west than I expected. At 6:25 p.m. I found myself in front of Fritz’s Gentlemen’s Club. “Your destination is on the right.” Hmmm… It was possible that the dojo leased space in the back of the club or at a nearby warehouse, but if so there was no sign of it. Now having only 5 minutes before the seminar was supposed to begin, I pulled into an empty parking lot and called the dojo. A gracious man named Michael answered the phone and let me know that the seminar wasn’t even there that night. It was somewhere near the beach, at a pier, and he didn’t have any other details. I confess I was a bit peeved, having rushed all day to get there, and then learning I was going to be missing it anyway. If there was a memo, I hadn’t gotten it. Rrrr… Bless his heart, Michael kept his center, along with his cheerful demeanor, and let me know that the seminar wasn’t a dojo-affiliated event – it was just using their facility on Saturday and Sunday. He also gave me correct directions to the dojo – same street address, next city to the east (Orange, not Anaheim), just 4 miles down the road. Given that I was suddenly free for the evening he invited me to come on over and watch some shodan (first black belt) exam run-throughs. I could even take ukemi if I wanted to. They’d be starting at 7:30. Time to practice some real-life Aikido. Things were not unfolding as I had expected. I needed to flow with what was actually before me at the moment, letting go completely my ideas of how things were supposed to have gone and moving forward into this new reality. Now with an hour to spare, and not sure what I wanted to do yet, I headed to the hotel and checked in. Cute enough place, quiet, with friendly staff. A tiny room, but with all the necessities of life. I considered my options as I unpacked my bags. I’d only grabbed snacks here and there all day, and I was really hungry. I could go to dinner, have a relaxed evening of writing, and get a good night’s rest to be ready for tomorrow. I was right across the street from Disneyland, too! It was a warm summer night, and I could easily walk over and hang out at the park for a few hours. That would be nice! Or I could go to a completely unfamilar Aikido dojo in a different lineage from my usual training, where I didn’t know anyone, and crash their exam run-throughs. If you know me you’ll have already guessed what I chose. I snarfed down a handful of raw Brazil nuts and a banana, and set off for the dojo. I threw my gi bag in the car, just in case, but figured it would be stressful enough for shodan candidates to be doing exam prep without having to deal with an unfamiliar uke. Equipped with proper directions the dojo was easy to find. There was a big sign and plenty of off-street parking. It was a beautiful, spacious facility, too! When I arrived a class of well over 20 kids was just ending, with parents relaxing in a lounge area with several couches and chairs. In another corner there was an office area defined by folding screens. On the wall near the desk there was one of those big boards that I’ve only seen in photos, with a vertical wooden “card” with each member’s name, in kanji (I think), organized by rank. The far side and rear walls, opposite the shomen, were mostly floor-to-ceiling windows, with tidy weapons racks on the narrow solid parts between the glass. In addition to the lounge area there were wooden benches along the windows. A lot of people were milling around, with kids leaving and adults arriving for the exam run-throughs. I found someone, who found Michael, and I introduced myself as the one who had called earlier. It turns out that in addition to training there, Michael is an acupuncturist with his practice at the dojo. Having let them know who I was, this stranger lurking in their dojo, and knowing they were all busy getting ready, I excused myself, found a place on a bench along the far windows and sat down to watch. Almost immediately I saw I’d made the right choice by not trying to bow in for the session. Everything was different from how we train, and I would definitely have been in the way! Better to watch and see how things are done in another organization. Everyone lined up by rank, another thing I’d only heard about. Someone shouted an instruction to bow, which I had seen before at least, and they began. A young brown-belt, Liz, who I soon learned was to be one of the exam candidates, was asked to lead warm-ups. This is something I’m often called on to do at our dojo, so I was eager to see how she went about it. After leading everyone in running a few laps, slapping the mat at all four corners as they went, she called out the name of each exercise, and the class responded by repeating the names. “Aiki taiso, ikkyo undo! Ichi, ni, san,” and so on. I thought it might be fun, if I could remember all the names, to lead warm-ups like that one day at our dojo, just to change things up. As part of the warm-ups they even did line drills, running everyone through a variety of techniques and ukemi in three or four groups going across the mat. After warm-ups the class lined up, sitting in seiza, again by rank, along the back edge of the mat. The higher-ranking students sat on the right, farthest from me. Three yudansha (black belts) sat at the front, in the corner to the right of the shomen, like Sensei does for our exams. There would be two people doing their mock exams, Liz and a man whose name I regret I’ve forgotten. Liz was to go first. The way it went was that one of the black belts, who turned out to be Ishisaka Sensei, the dojo cho, called an uke up, specified an attack, and instructed Liz to demonstrate “five arts” from that attack. The uke would pop out behind the line of students, dash to the end nearest me, bow onto the mat, and join Liz at the center. The attacks were much faster and harder than we normally do, with correspondingly fast and hard techniques and ukemi. Again I was glad I’d decided just to watch. At best I’d have been a nuisance. At worst I’d have gotten myself injured in a big hurry. Perhaps I could work up to it, but coming in cold to a shodan-level workout… Uh, no, thank you. Liz’s technique was really sharp, very impressive. After each set of techniques the uke would be excused and the three instructors would review what she’d done well, where she could improve, make note of things to go over in class, and so on. What a privilege to get so much insight into how they train in just one evening! A few times they commented on her getting winded. Clearly she was in awesome shape, so that wasn’t the problem. But she was also nervous, I think. Who wouldn’t be? I could see she wasn’t breathing enough during the first few techniques of each set – her mouth was shut tight – and then she couldn’t get caught up. I sat watching, trying to will her to breath deeply right from the start. “Breathe, Liz!” I thought. Funny how that doesn’t work. Haha. After the open-hand techniques there was some weapons work – solo forms (kata), take-aways (dori), and throws (nage). The kata were different from ours, but the principles were the same. Then randori, free technique with 3 or 5 attackers, I forget which. At my dojo we attack as though we intend to land the strike, reaching our target and following through, but man… This was faster and more intense. Have I mentioned it’s a good thing I didn’t try to join in? Wow! Liz received some more feedback from the instructors and returned to the line. The next candidate came forward and the process was repeated. Finally, around 9:30, the group bowed out. Afterward I introduced myself to Liz and the other candidate, and thanked them for the opportunity to watch their test run-throughs. I’d hoped it hadn’t distracted them to have some unknown person watching from the sidelines. It was a really special glimpse into how people train at another dojo, and I was grateful to be there. I also met Ishisaka Sensei, who I think was the first person I’d spoken to when I arrived, but hadn’t realized at the time he was the dojo cho – he’s a young-looking sensei! A group was forming to meet up for dinner, and he invited me to join them. How could I resist hanging out with such friendly Aikido people? Besides, by that time my earlier snack had worn off completely and food was again a high priority. About 15 folks met up at Norm’s restaurant, just down the street. They shared the usual recounting of the evening’s events, a lot of laughs, and some tales of past adventures at the dojo. 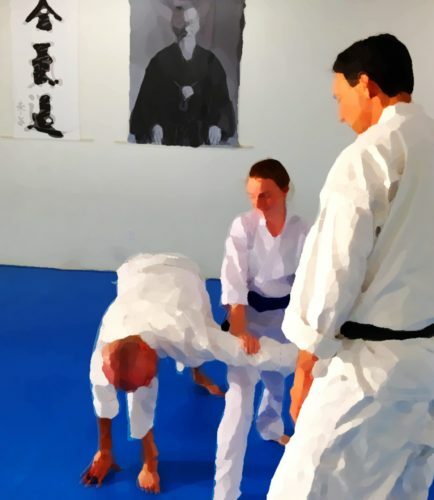 We talked a little about teaching, dojo management, and Aikido politics. At dinner I was honored to speak with Ishisaka Sensei a good bit. He is the grandson of the dojo founder, Harry Ishisaka. What a nice person! I was really impressed with his warm, family approach to leading his dojo community. I learned that the dojo is approaching its 50th anniversary, and is run as a non-profit organization. They moved to the current location a few months ago (in early 2013). Ishisaka Sensei and his students have been breathing renewed life into the dojo and programs along with the new facility and even a new website. Somehow he manages a full-time career, a young family, and the dojo. Much respect! Eventually dinner was finished, everyone tossed in their share of the check, and we all parted ways. I finally ended up back at my hotel around 12:30 in the morning, with just enough time to get a decent night’s rest before the seminar started in the morning. In the end, what started out as a disappointing, frustrating misunderstanding turned into a lovely evening, expanded horizons, and new friends I wouldn’t have met otherwise. The weekend’s seminar wasn’t a dojo event, so I wouldn’t see these folks again in the morning, but I was very glad to have had the chance to spend such a special evening with them. I’d love to get back up to train with them someday soon, too. This is kind of random, but it’s actually really important to my training. A couple of dojo mates asked about this recently, so I thought I’d share my thoughts here, too. But first… I’m not a doctor. This is all just my own understanding, and my personal experience. And no, Gatorade didn’t give me any free product or anything. Gatorade was created to help football players stay hydrated and keep their energy up. Players perform better late in the game when they drink Gatorade compared to just water. It’s not an “energy drink” with caffeine or anything to make you hyper/awake. It works better than water alone because it contains sugar, sodium, and potassium. I always have at least a decent snack (like raw nuts and a banana) before I go to class, and drink lots of water before, during, and after training. Staying well hydrated helps me avoid vertigo (BPPV) and orthostatic hypotension (y’know, when you stand up suddenly and start to white out – time to sit back down). In addition to eating something and drinking water, I’ve been pretty consistently drinking Gatorade between classes. If I don’t, I run out of steam and get stupid and slow halfway through the second class, which is often more vigorous training. Low blood sugar. By the way, I’ve tested my blood sugar before, during, and after training, and drinking Gatorade does not cause it to spike. I like the little packets of powder (they each make a quart) because I can keep it in my dojo bag and add it to my water bottle. It’s also great for traveling to seminars. Easier to carry than a case of bottles! I usually use it at half-strength – less powder, more water – and just drink more of it. The little powder packets for the flavor I like – Frost Glacier Freeze (light blue) – have disappeared lately. I’m guessing that’s because it contained bromated vegetable oil (BVO), which PepsiCo is now removing from at least the Gatorade line. So… I’ve been looking for a new flavor, and in the process I’ve been learning a bit about the different kinds. It turns out the sweeter flavors that I don’t like (usually fruity flavors) are made with just sucrose. Correction – the whole Thirst Quencher line has sucrose and dextrose. It’s the G2 products that are just sucrose. You can find more info here: http://www.pepsicobeveragefacts.com/infobycategory.phpThe less-sweet (but not “Low Calorie”) kind I’ve been drinking, turns out to have sucrose and dextrose, which is less sweet-tasting. This is a good thing (for me, anyway) because sucrose is broken down into dextrose and fructose, and I’m pretty sure my body doesn’t like fructose. More dextrose means less fructose. I think fructose is a factor in my neuropathy acting up when I eat apples, and in the episode of gout I had a while back, after (among other things) pigging out on grapes. So anyway, I’ve found that the Riptide Rush flavor is a sucrose/dextrose blend. I’ll probably end up getting that, but I want to try a bottle of it before I order a case of 144 packets. I’ve searched high and low for the darned stuff, and have discovered that it tends to be sold through construction and forestry supply companies, for work crews. They even sell pouches that make 5 gallons at a time, for those big orange drink coolers you see on all their trucks. If I find a particularly awesome supplier I’ll update this.